Kangaderoo Custom QR Code. : Free? I don't know if you have ever downloaded something that was labeled free. Free always seems to come with its own constraint. 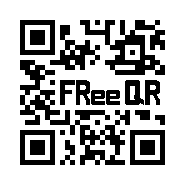 A free Custom QR Code, but the link in the code will be routed through and advertizment page. Here is the code in question. A nice call-to-action in the middle of the QR Code, using the magic "Free" word. Op-on scanning, or clicking on the actual graphic for the desktop users, you will see a nice advertizement for 5 seconds before being forwarded to my website. Putting up a Neon Sign. Time for a real dynamic QR Code. Playing with the Error correction.